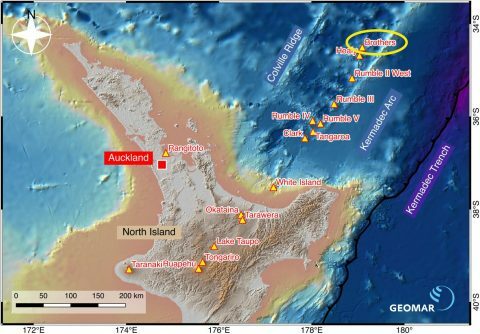 During International Ocean Discovery Program Expedition 376 “Brothers Arc Flux” (5th May to 5th July 2018), the drilling vessel DV JOIDES Resolution will drill multiple sites into the Brothers submarine volcano, about 400 kilometres northeast of Auckland, New Zealand. It is the first time that a ship attempts to drill almost one kilometre into an active volcano, 1500 m below the sea level. The heat of the volcano drives hydrothermal convection with cold seawater circulating through the volcanic edifice, heating and returning back to the seafloor close to the top of the volcano. On its way, the hydrothermal fluids alter the volcanic rock, taking up large amounts of sulphur and metals. The discharge of these fluids at the seafloor, often in form of several metres high sulphide chimneys lead to the term ‘black smokers’ because the tiny copper, zinc, gold and silver bearing minerals let the pressurised fluid to appear black. IODP Expedition 376 aims at recovering cores from the deep part of the hydrothermal cell in order to provide the scientist with information about the geologic processes deep inside the volcano. Morphological map of New Zealand’s North Island and surrounding seafloor. Active volcanoes are shown by yellow triangles. Philipp Brandl and Karen Strehlow are two post-doctoral researchers from GEOMAR Helmholtz Centre for Ocean Research Kiel specialised in the fields of geochemistry, petrology and volcanology of arc volcanoes. Both have been invited to the expedition to contribute with their expertise to the success of the operations. Their main task will be to describe the drilled cores in all their facets before individual research is carried out.